TACLOBAN CITY – The Sangguniang Panlalawigan ng Leyte, during its first session on July 6, passed a resolution pushing for the postponement of the barangay and SK elections set for October this year. Presided by Vice-Governor Mimyet Bagulaya, the members of the Provincial Board unanimously passed the SP resolution taking into consideration that the country has just been through a synchronized election and the people in local communities are still reeling from the divisiveness caused by the May 10 elections and needed time to heal. The basic premise of the postponement is cost and savings to government, the board members said. Considering the budget deficit the Aquino Administration is facing, the postponement of the elections is called for and instead to use the funds for the elections for priority programs instead, the board members added. These programs, the board members said, are the construction of more classrooms, delivery of health services and housing. Earlier, the Liga ng mga Barangay in the Province of Leyte passed a resolution urging the Congressmen in the five districts of Leyte to introduce a bill to postpone the October 2010 barangay elections. The resolution which was signed by the majority of the members of the League noted that the October 2010 barangay and SK elections is to close to the just concluded May 10 elections. In 2007, the government spent at least P2 billion to hold barangay elections. This year’s elections could cost more than P3 billion. Plus, the government spent about P13.5 million for the conduct of the May 10, 2010 elections. The country has 42,025 barangays, according to the Department of Interior and Local Government's National Barangay Operations Office. Each barangay has seven barangay kagawad or seven per barangay which means a total of 294,175 barangays officers. Electing the same number of SK officials, all in all, there are 672,400 barangay and SK officials to be elected. TACLOBAN CITY – There are already thirty seven people in Eastern Visayas who have died due to dengue, the Department of Health Region 8 informed. There is already a total of 3,862 cases of dengue with 37 deaths that have been recorded across Eastern Visayas from January to July 3 of this year, Mr. Boyd Cerro, the sentinel nurse of DOH Region 8 said. Of the 3,862 cases reported, the biggest number of cases came from Tacloban City which has already a total of 1,014 cases. Although the local health authorities admitted that they are alarmed over the increase in dengue deaths in the Region, they said that there is no reason to declare a dengue outbreak. There is only clustering of cases, they said. The DOH 8 have issued a dengue alert to all health officers in the Region because of the onset of the rainy season. In fact in June, the Health Department conducted Dengue Caravan in all the provinces of the Region. Mr. Cerro said that health workers have also been advised to constantly remind communities of the dangers of dengue. He said that based on the DOH 8 assessment, the increase in dengue cases is largely attributable to the communities' neglect of the health department's advisory for the prevention of dengue. Earlier, the Department of Health Region 8 Director made repeated appeals on the local government units especially the barangay officials to again conduct surveillance of the breeding places of mosquitoes in their communities, and the sustained cleaning of the surroundings and every respective homes must clean their own homes and surroundings. The Regional Health Director reminded about the Four O’clock Habit which every community must practice. TACLOBAN CITY – Seven out of 10 Filipinos or 70.72% give their thumbs up on the overall performance of the Philippine National Police. This is the result of the survey conducted by the by the Asia-Pacific Center for Research (ACRE) in May 2010 to provide the PNP a comprehensive data on how its personnel and the services they provide impact on the people and the community they serve. When asked about this during the recently conducted Harampang Ha PIA, Police Region 8 Director Rey Lañada attributed the survey result to the continuing process of transformation in the PNP organization. Director Lañada expressed his happiness and satisfaction with the high approval rating of the PNP. “This shows that the gains of the various transformation programs and initiatives that we have been doing in the PNP are already taking roots,” Director Lañada added. General Lañada also thanked the people for having learned to trust the police as their partner in the maintenance of peace and order in the community. The good Director also assured the public that he will not think twice in giving disciplinary action to any member of the Police Force who refuses to answer the call of duty or abused his power over a civilian. He also told the local media to report to him the names of the abusive members of the PNP and assured them that he will look into the matter. This is a proof that the Philippine National Police is determined and is very serious in its transformation program. For the study, ACRE used a population sample of 4,400 respondent-households covering all regions, all provinces and a statistical sample of cities and municipalities. Of the total number of respondents, 50% are male and the other 50% are female whose ages range from 16 to 60 years old and up. ACRE said 10% of those surveyed belong to AB and C socio-economic class, while 70% fall under the D socio-economic class, and the rest, or 20% are in the E class. TACLOBAN CITY – Palo Mayor Remedios “Matin” L. Petilla was chosen unopposed by members of the League of Municipalities-Leyte Chapter (LMP-Leyte). Thirty six local chief executives coming from different municipalities of the province attended the first reorganizational meeting of the league where, aside from the league chapter president, new set of officers were also chosen who would sit as officers in the next three years. During the course of the election for the rest of the new set of officers, the league gave the newly elected president authority to nominate the rest of the officers to include the Vice-President, Secretary, Treasurer, Assistant Treasurer, Auditor, Public Relations Officers, Sergeant at Arms and Board of Directors. This set of officers is mandated under the league’s by-laws. Nominated and approved by the league as their new officers were Javier Mayor Sandy Javier as Vice-President, Alangalang Mayor Loreto Yu as Secretary, Lapaz Mayor Lesmes Lumen as Treasurer, Hilongos Mayor Jose Roble as Assistant Treasurer, Leyte Mayor Noli Ysidoro as Public Relations Officer and Palompon Mayor Ramon Oñate and Calubian Mayor Doroteo Palconit as Sergeant At Arms. Chosen to sit as Board of Directors were Tanauan Mayor Agapito Pagayanan for the First District; Burauen Mayor Fe Renomeron and Capoocan Mayor Federico Carolino for the Second District; Villaba Mayor Claudio Larrazabal for the Third District; Kananga Mayor Elmer Codilla for the Fourth District and Hindang Mayor Elpidio Cabal Jr. for the Fifth District. Meanwhile, in an interview after the elections, Mayor Petilla said she sees no influence of the governor in her election as the new provincial chapter president of the League of Municipal- Leyte Provincial Chapter. She disclosed her son, Leyte Governor Carlos Jericho Petilla, did not even know of her interest to run until it was revealed in a media interview weeks before their respective formal oath of office end of June. Even then, she added, she remained confident of the mayors’ support as she knew most of them and worked with them when she sat as governor of the province for a period of nine years. “I was banking on the support of the mayors. I know them and I talked to them before this assembly was set,” Mayor Petilla said. The lady mayor got unopposed in her bid as league provincial chapter president with Babatngon Mayor Chari Chan giving the nominations. As earlier reported, Carigara Mayor Trinidad “Ebbie” Apostol also expressed of her interest to run but in later interviews revealed that she can back down on her plan just to maintain the unity and cooperation of the different local chief executives in the province. Apostol was noted to be “not in attendance” during the said LMP assembly held at the Governor’s Hall of the Leyte Provincial Capitol. Mayor Petilla said she does not know the reason for Apostol’s absence but added “it would have been nice if she was here”. CATBALOGAN CITY – Neophyte mayor from remote Matuguinao town thanked the Department of Interior and Local Government (DILG) for offering a training dubbed as "My First 100 Days". The training was aimed to help newly-elected local chief executives get acquainted with their tasks and responsibilities. DILG offered the ‘course’ through the Local Government Academy (LGA) led by its Executive Director Marivel C. Sacendoncillo. Melissa dela Cruz, the youngest mayor of Samar acknowledged DILG for the training. The young lady mayor was reluctantly thrown into the political arena when her father, the late Carlos dela Cruz was gunned down in their own home in Catbalogan City. She accepted the nomination from his father’s party with the firm resolve to do her homework and follow advice from her elders. “The party gave me a big responsibility and I am willing to sacrifice,” the young dela Cruz confided to PIA in an earlier interview. Young and single as she is, dela Cruz put her personal agenda aside for his father’s commitment to Matuguinao. Eager to learn good governance, she welcomed the offer of DILG to enroll in the training. “I learned a lot from the seminar,” the young Matuguinao Mayor said in a text message. “The seminar was a great help to us newly minted officials in making a good jumpstart of our administration, good thing that DILG and LGA came up with a program like this,” she further said. Among the modules in the training was Financing LGU Operation to provide the local chief executives with an overview of the LGU Fiscal Management. They also learned the sources of local revenue and alternative external sources of revenue, how to formulate the LGU financial strategies, thus promoting financial accountability of LCEs, among others. CATBALOGAN CITY – As Calbayog City Mayor Reynaldo Uy reports to his office, he immediately released his first Executive Order. Mayor Uy last Friday signed Executive Order No. 1, creating an Ad Hoc Committee tasked for the creation of the Calbayog City Hospital. The EO cited proper health service delivery as one of the primary objectives of the LGU. It added that it is the human right of every Filipino to have access to proper health care. It also cited that the only government-owned hospital in Calbayog has become ineffective and failed miserably; whereas the private hospitals currently serving Calbayog charge exorbitant fees. The City Government believes that proper medical and hospital care should be given especially to less fortunate Calbayognons. The Ad Hoc Committee shall be tasked to search for an area where the City Government could construct a hospital; also to look for appropriate funds needed for the construction. The same committee shall search for a doctor/surgeon to head the hospital and take charge of the staffing. Dr. Sylvia De Guzman (OIC, City Health Officer) is chosen as Chairman with Vice Chair Ms. Geronides Mancol (City Budget Officer), members included Chair of the Sanguniang Panlalawigan (SP) Committee on Health, Chair of the SP Committee on Appropriations and Engr. Gil Lentejas (CPDO), Mr. Joselito Montealto (City Assessor), Atty. Oscar Hugo (City Engineer), Engr. Arnol Trani (Chief of Staff, Congressional Office), Mr. Emerlito Montealto (City Administrator) and Mr. Federico Resente, Jr. (City Treasurer). QUEZON CITY – The human rights watchdog Karapatan expressed dismay over the impending appointment of former Akbayan representative Loretta Ann Rosales as chairperson of the Commission on Human Rights (CHR). “Our experience bears out that Ms. Rosales has shown bias against human rights violations victims and advocates such as Karapatan,” Marie Hilao-Enriquez said, Karapatan chairperson. 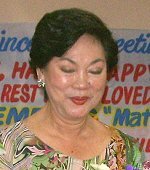 Enriquez, arrested and detained during martial law, cited the class action suit against the Marcoses filed by the Filipino victims in which former Rep. Rosales created divisions among the victims by agreeing to a compromise settlement with the Marcoses and establishing a separate group of victims that would choose monetary settlement over justice for the entire class. Over the last years, CHR has gained its credibility because of the willingness of the victims and different human rights institutions to cooperate. On this note, Ms. Rosales will not be able to earn the trust, confidence and cooperation of the victims and human rights organizations affiliated with Karapatan. “President Aquino must think twice in appointing Ms. Rosales. He must heed the call of the CHR to subject the selection of the CHR chairperson to a transparent selection process in which human rights organizations truly working on the ground will also be allowed to voice out their choice,” Enriquez concluded. QUEZON CITY – Amid the brewing dispute over the proposed cutback in the pork barrel of members of Congress, Cavite Rep. Elpidio Barzaga Jr. is pushing for "greater transparency and public accountability" in the use of the funds, in accordance with President Aquino's pledge to fight malfeasance. "We should encourage if not require the full publication of all pork barrel-funded projects. This way, the public will be able to see clearly how their representatives and senators are spending the funds," Barzaga said. "Let us publish the specific use of the allocations every six months in national newspapers, and post them on the web sites of the House and the Senate, for all to see and scrutinize," Barzaga said. "If district constituents are not happy with the way their representative is spending the money, they can remove the official in the next elections. If there are anomalies such as ghost or overpriced projects, they can readily file the appropriate complaints," he said. Barzaga said his proposal "is also consistent with the new administration's promise to improve governance." "In fact, this is precisely the 'openness in matters of public interest' being sought by the proposed Freedom of Information bill," he added. Quezon Rep. Lorenzo "Erin" Tañada III, spokesperson of Mr. Aquino's Liberal Party, wants to lower by as much as P10-billion the Priority Assistance Development Fund (PDAF) of legislators to help the new administration cover the budget deficit and avert the imposition of new taxes. However, the incoming House minority leader, Albay Rep. Edcel Lagman, immediately rejected the proposed pork barrel cutback, calling it "flawed, cosmetic, counterproductive and anti-poor." "Personally, I have no problem with slashing the pork barrel, as long as it done fairly and equitably, to include the executive branch, in the spirit of burden-sharing," Barzaga said. Barzaga nonetheless stressed the need for the new administration to draw up a definite strategy to address this year's projected P300-billion gap between government spending and income. "If the deficit is P300 billion, should we bridge it with P150 billion in extra revenue collections, and a P150-billion budget cut? Or should we just lessen the budget by P300 billion?" Barzaga said. Barzaga pointed out that Kim Henares, the new chief of the Bureau of Internal Revenue, had already vowed to increase annual tax collections by P150 billion, by simply running after tax dodgers, corrupt agents and smugglers. Barzaga also noted that Mr. Aquino's advisers previously claimed they expect to generate up to P400 billion in annual savings as a result of reduced corruption. "We need sound and actionable strategies to achieve the P150-billion increase in revenue collections without having to impose new taxes, and to realize the P400 billion in savings," he said. TACLOBAN CITY – The Anti-Illegal Drugs Special Operations Task Force of the Philippine National Police Region 8 continuous to score high in its drive against illegal drugs, as it recovered two more cocaine bricks weighing about two kilograms during its massive crackdown operations in Maydolong, Eastern Samar. PNP 8 Director Rey Lañada informed that at around 4:00 o’clock in the afternoon of July 5, the PNP8-AIDSOTF assigned in Maydolong Municipal Police Station led by Chief of Police Vergel Untalan recovered more than two kilograms of cocaine from one person identified as Eledio Plego of Barangay 7, Maydolong, Eastern Samar. The recovery was effected after the said PNP conducted massive information drive. The said two bricks of cocaine which weigh more than two kilograms are now in the custody of the Maydolong Police station. The latest recovery brings to a total of thirty-five (35) the number of bricks of suspected cocaine weighing more or less thirty five kilograms, recovered by the joint team. The 35 cocaine bricks recovered have a total street value about P196 Million, Director Lañada said. It would be recalled that the elements of the Philippine National Police have recovered 33 cocaine bricks amounting to P185 million and apprehended six persons who were selling the same, in two separate buy bust operations in Eastern Samar on June 30 and July 1, 2010. The group acted with the guidance of PDG Jesus A. Verzosa and PDDG Edgardo Acuna, Task Force Commander of AIDSOTF, who ordered the intensified operations after receiving information that huge volume of cocaine are being sold by a group of fishermen in Eastern Samar, Director Lañada added.